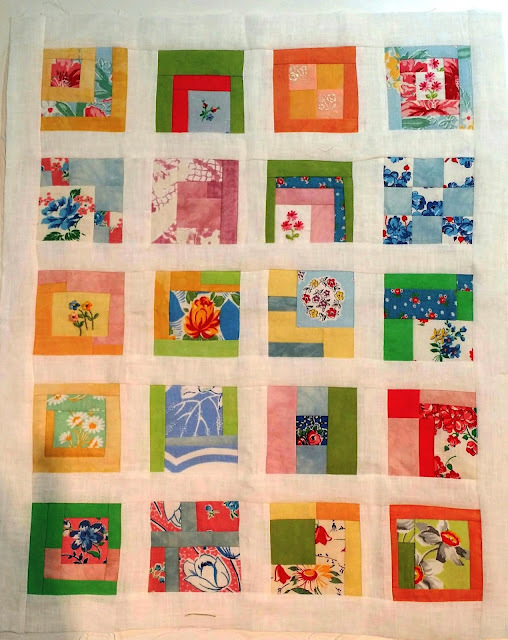 A Busy Quilter's Garden ! I love gardens,and if there were 36 hours in a day, weeds didn't exist, and my knees were not 65 years old... I would have a big beautiful garden for both flowers and veggies.. But it seems the only thing I'm willing to make time for is the part where you buy the plants! That's right..just like shopping for quilt fabric...plant shopping is so much fun! 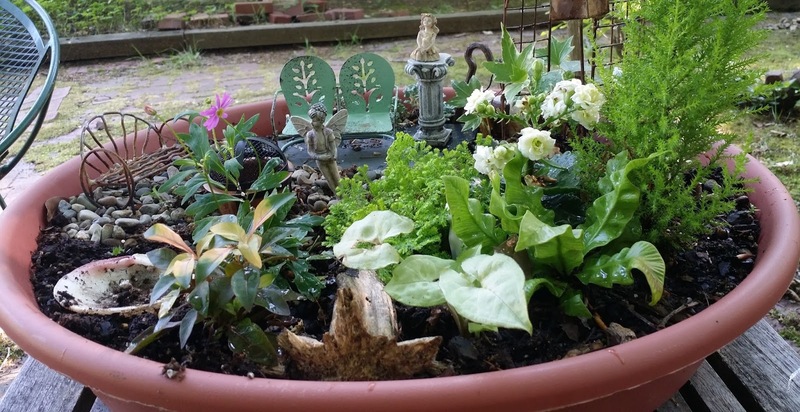 The grandkids love to go plant shopping..and we share the perfect garden! It's in a 24" saucer shaped container, has a path and a "shell" swimming pool (I just noticed in the picture ..the pool needs cleaning). there's a few places for the fairies to sit, a bunny, and a variety of perfect sized plants and the stem from last year's pumpkin that looks like a fallen log. Granddaughter, O, loves to play with the fairies, and she helps me weed the garden and prune the plants. The tiny fairy actually looks like her! She and the fairies were happy to discover that one of our plants...new this year...gets tiny purple flowers. Fairy gardening is so much like quiltmaking...You get to shop, trade, and search around for different textures...and piece them together in a visually pleasing arrangement. And you can take care of it and still have plenty of time to quilt! Grandson L asked me to tell you , we also have a venus flytrap who lives in the kitchen. "If only he liked the outside, he could live in the fairy garden"